Valerie: Regretfully, we have to announce that the recorded message for Cosmic Sai Baba on 6th June, 2017 at Moss Vale was lost (see the Addendum below). And that the message as written is half of what we know he said and the rest is what we think we remember what he said. I cannot remember anything after the Transmission is given – which is why I like to do the transcript so I can keep abreast with everyone else! What is given below is what people have been able to recall of the transmission. For more, see the Addendum at the end of this page. ❝I am here, and I am very pleased to be here. You had a little technical problems. But I am here. I hope you all have been doing some research? Because I would like to announce that we have always been from the point of the Andromedian system and of Universal Love that has been sent to the little Earthlings on the planet to understand. So we have been around for a long, long, long, time. Long before your planet has been created. But I wanted you to know for many of the teachings they all came from Andromeda in the first place. They came from the place Andromeda – it is a place of Universal Love. It is the Angelic Realms who have created your planet Earth. We have been working with planet Earth, I want you to know because you are not alone. There will be an announcement that the new generation would like to come. They are still expecting me to communicate with them that it will be too much on Earth because not all are free from fear. Maybe you would like to think about that? We want to show you the big picture. So we have been working with planet Earth. They want you to know that NOT all from Andromeda are a very different species from you but rather we/you are similar. They are similar to your human race only they are far advanced – thousand of years ahead in your future. The time is coming … … where you will be presented with a choice. One option is to raise your level of frequency or consciousness. The other choice is to remain in the current level of 3D/4D materiality. The Earth itself is evolving and is soon to transition into a higher dimension or frequency. Some will go with it and we hope that you will. Those who are not ready to transition to higher states will be transported to another 3D material planet for their continuation. On 7 March 2017, Cosmic Sai Baba gave over the monthly message to Archangel Mikael. There is a video of the monthly message and Archangel Mikael speaking through Valerie. 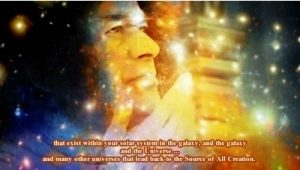 The message given by Archangel Mikael echoes much of what is recalled of the message of Cosmic Sai Baba, above. We urge you to watch this video, here. We are told that there is a physical location for the Angelic Realms (in the galaxy Andromeda) and that they have been assisting the little Earthling ever since the human was first created. They also tell us they (the angelic realms) created the Planet Earth in the first place.